4ipnet solution supports various methods for Wi-Fi user authentication that can be easily enforced across all deployment scenarios, including Enterprise authentication such as 802.1X and browser-based with existing internal/external databases and Guest authentication such as social media login, ensuring the proper identification of network users before granting access to the network. 4ipnet's WLAN solution supports both 802.1X and browser-based authentication for large-scale wireless network such as campus or enterprise, providing a secure and reliable Wi-Fi experience for users. 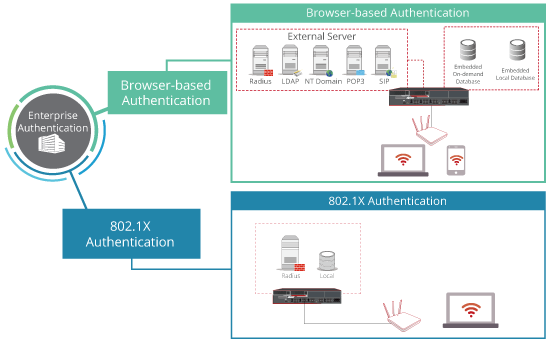 Guest Authentication provides a key component to the flexibility, providing administrators with the ability to selectively allow non-authenticated users access to network resources. Copyright © 2017, 4ipnet Inc., All rights reserved.